Economical: A low feeding rate of .50 to .75 lbs/head/day means lower feeding costs (on a per head per day basis). High Mineral Fortification: This supplement is mineral fortified eliminating the need for additional free-choice minerals, resulting in feed cost savings of 5¢ to 8¢ per head per day. 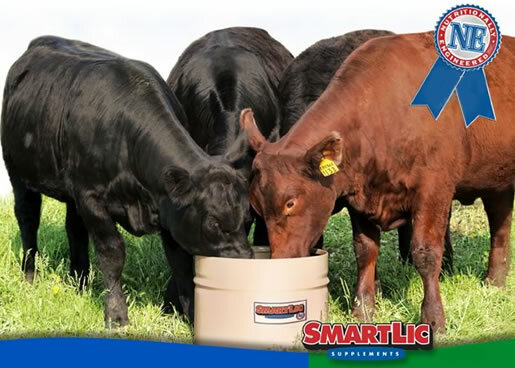 Minimal Labor: SmartLic® supplement is easy to feed. Simply place the blocks in areas of easy access to the cattle. When all-natural protein is desired for your cattle, then NE-Natural 20 is the smart choice. This product contains only natural protein sources. NE-Natural 20 is recommended when ammonia-treated forages and rations are already part of the diet. NE-Natural 20 is ideal for young or growing calves (400 lbs. of body weight or less). Based on 3/4 lb intake, NE-Natural 20 is highly fortified with vitamins and trace minerals. NE-Natural 20 contains up to 125% of the new NRC nutrient requirements for trace minerals. For feeding instructions, fortification information, guaranteed analysis and ingredient listing download the NE-Natural 20 product sheet PDF!